Our skilled artisans are experts in working in hand hammered and hand tooled copper, and their expertise is reflected in this gorgeous, handcrafted, Western style bed. The bed has a wide, rectangular headboard built with a solid, timber frame. The top of the headboard has a classic, straight, top rim, and below the rim are exquisite, hand carved, geometric designs. The front of the headboard is embellished with a large, rectangular, hand hammered, copper panel. 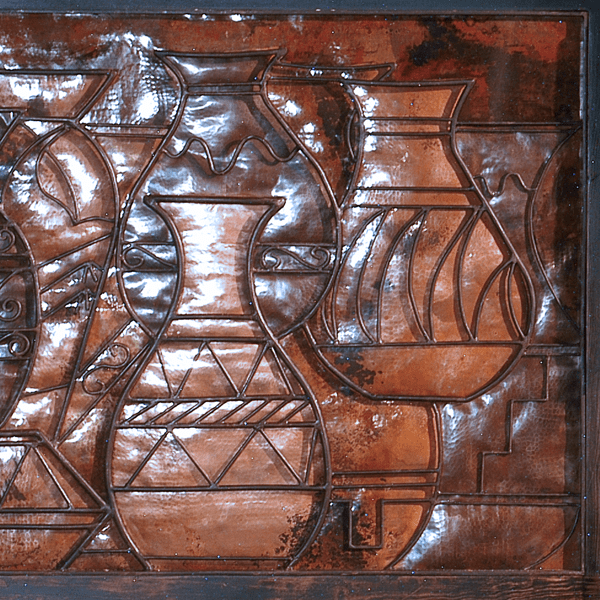 The panel is adorned with a highly detailed, still life of various hand hammered and hand tooled, stylized, copper pots. The headboard is framed on each side with solid wood uprights, and the top of each upright is garnished with a hand turned, irregular sphere. The front of the each upright is accented with a hand hammered, copper panel, with hand forged, copper conchos on its face. The bed has a wide, rectangular footboard, and below the top of the footboard are ornate, hand carved, geometric designs. The front of the footboard has a wide, rectangular, hand hammered, copper panel. 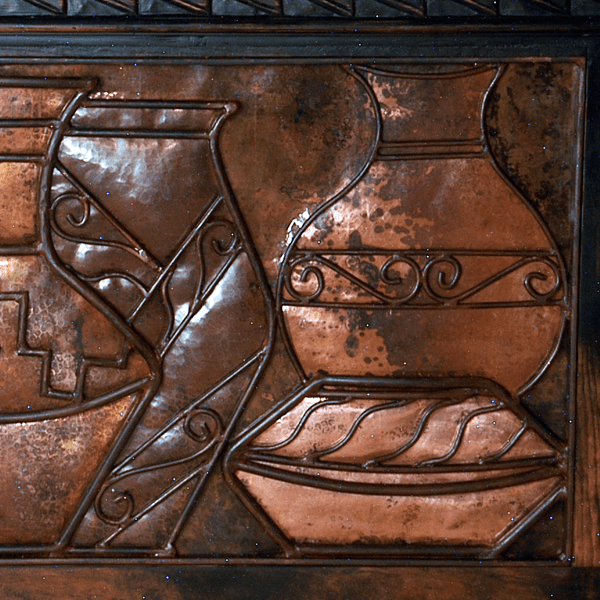 The panel is enhanced with exquisite, hand hammered and hand tooled, stylized, copper pots. 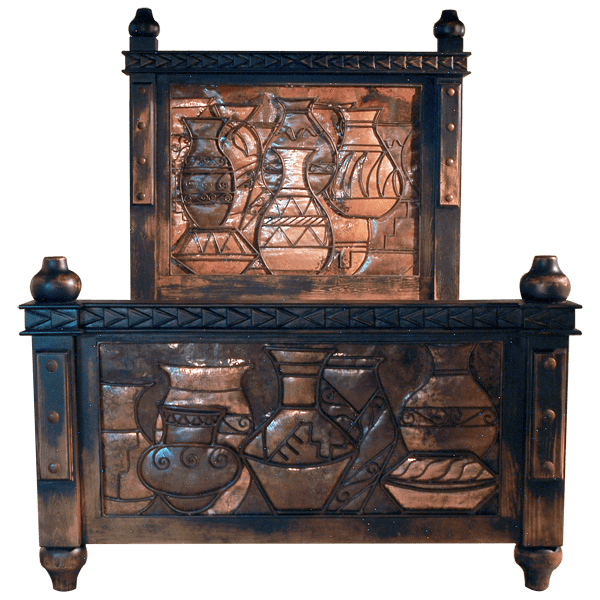 The footboard is framed on each side with solid wood uprights, and the front of each upright has a hand hammered, copper panel, with hand forged, iron conchos on its face. Each upright is topped with a hand turned, irregular sphere. The bed has solid wood, side rails, and it rest on hand turned, tapered feet. It has an antique finish, and it is made with the best, sustainable, solid wood available. The bed is 100% customizable.